En 1940 las fuerzas alemanas capturaron unos 20 tanques Mk. VI británicos. Los vehículos capturados se utilizaron para la instrucción hasta otoño de 1942. En noviembre, decidieron desarrollar artillería basándose en los Mk. VI capturados. En 1942 se crearon modificaciones con obuses de 105 y 150 mm. Toda esta artillería se perdió en la defensa de Francia durante el verano y el otoño de 1944. A decent Tier 2 SPG. Note that the long range of the gun is somewhat hampered by a radio that cannot reach far. This can lead to games where allies advance out of radio range, leaving you with no targeting information. The 105mm howitzer, while being a rather large gun for the second tier, even on artillery, pays for its range and damage with a reload time that can be defined as abysmal. Nothing carries over from the Leichttraktor. First, research the Meadows ESTL Engine. Now, research the G.Pz. Mk. VI (e) Suspension. Finally, research the FuG 5 Radio. The G.Pz. Mk. VI (e) is based on the Mk VI British light tank, produced by Vickers-Armstrongs in the late 1930s. Some Mk.VIB light tanks were left behind by the British expeditionary force during the Dunkerque evacuation and Germans captured them damaged, but more or less intact. In 1940, 6 of them were rebuilt by the Germans to carry a 105mm leFH 16 howitzer and a MG34 machinegun. 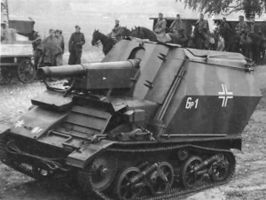 The howitzer was enclosed in a thin (11-22mm thick) superstructure and the vehicle was open-topped. In fact, the superstructure was thicker than the hull armor. 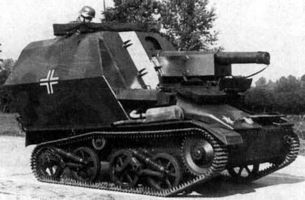 The new improvised self-propelled gun was crewed by 4 men and powered by the original Meadows V6 (87hp), allowing it to go as fast as 50 km/h on the road (but only 20 km/h in terrain). Earlier it was believed that these SPG's were never actively used and spent their "life" in Belgium as training vehicles. However, now it seems they were transferred to the Artillerieregiment 227, fighting near Leningrad in late 1941, where they apparently survived until 1942. The full German name of this vehicle is 10,5cm Selbstfahrlafette auf Geschützpanzer Mk.VI(englisch). Esta página fue modificada por última vez el 25 oct 2016, a las 10:14.